But you don’t — at least not all of the time. You’re lucky: you have a valuable, remote-friendly skillset, one your company happily lets you exercise from home. The caveat? You have to be on. You have to be equally productive, creative, and effective in your chosen space, which is easier said than done. It requires a calculated approach; preparation. It’s still your job, after all. You want to get it right. In any case, until you’ve gained some work-from-home experience, don’t wing it. Instead, arm yourself with some best practices. This article will highlight the fundamentals: what tools to use; how to situate yourself; how to organize your time. More importantly, it’ll give you a snapshot of a healthy, productive work-from-home environment, one that you can fearlessly emulate. Are you naturally self-motivated? Because if you’re to autonomously work from home, you better be. You don’t have a choice in the matter. You need to be disciplined with your time and task management. What we wear impacts how we feel and, in turn, how we behave. A suit, for example, can evoke confidence; sunglasses can ease anxiety. That said, don’t start your home workday predisposed to coziness and lethargy because you refuse to lose the sweats. Instead, wear a dressed-down version of what you’d wear to the office. Point is: be comfortable, but not too comfortable. You’ll be more productive for it. Keeping a routine is a potent and practical way to stay consistently motivated and focused — to be on. Once ingrained, your routine will keep distractions in the background, helping you stay on-task. To create a routine, begin by breaking your day into hour-long blocks, like an agenda. Up by 8:00 AM, showered by 8:30, then coffee and breakfast before sitting down to answer your first email at 9:00. That’s “Hour: 1.” How will the next hour play out? Answer that question through “Hour: 8” and you’ll have in front of you a freshly minted routine. Now commit to it. Over time, you’ll find yourself bending to the comfort of your routine. You’ll catch yourself not thinking, just doing. That shows you’re growing productive, and each time you realize it, you’ll be reminded of a valuable lesson: getting started is almost always the hardest part. Have you ever attempted to set weekly, daily or, perhaps, even hourly goals for yourself? These are called micro-goals, and they’re designed to keep isolated workers constantly challenged, driven, and improving. Don’t work from bed. It could short-circuit your brain, confusing it to think that bedtime is actually work time, and vice versa. Don’t work from the couch or at your kitchen table, either. Those are your spaces. That’s where you go to unwind, relax, and take your mind away from the job. A dedicated work desk, on the other hand, will flip a switch in your head every time you sit down at it. It will make you feel like it’s time to work. Closing the door behind you. It’s a simple concept, but that doesn’t make it stupid. Think of it this way: closing the door behind you is like locking in a deadline or like committing to a goal. Ultimately, it’s setting the stage for something powerful: focus. Anything could be happening out there — the PlayStation could be purring; Netflix could be on; dishes could be piling up — but none of it matters on your side of the door, in your space, behind your dedicated work desk. You’re in the zone at that post — and that means 10:00 AM is the new noon. If “Your Structure” is really about managing your motivation, and “Your Space” is about maximizing your focus, then “Your Tools” are about optimizing your communication. Remember: as a remote employee, you’re still expected to work fluidly on a team. As fluidly as you would if everyone was sitting in the same office together. Thankfully, there are tools to help you do that. Slack lets you do all your team communications in one place, combining multiple forms of messaging and file sharing. The app lets you create “Channels” that help isolate topics and people for discussion. It also integrates with DropBox and dozens of other tools, allowing you to send documents in an array of formats. Zoom is a popular video and web conferencing tool. The service brings cloud video conferencing, online meetings, group messaging, and a software-defined conference room solution into a single platform. Like Zoom, Google Hangouts brings people face-to-face. Hangouts also has the added benefit of integrating with your Google Calendar and Gmail. That said, it’s not as robust as Zoom, cutting your meeting size to a maximum of 10 people. You can browse a complete comparison list here. 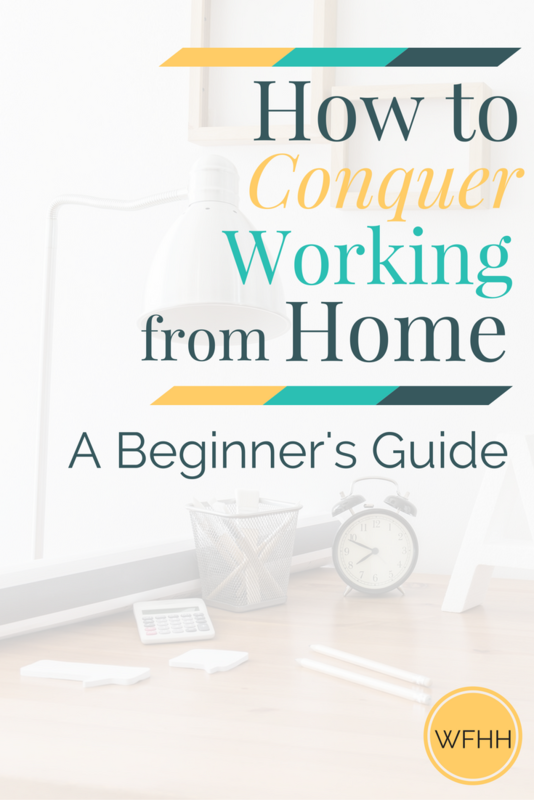 You really want to know how to conquer working from home? After all, working remotely is a deeply personal and unique experience for everyone who does it. We all have our own routines, our own idiosyncrasies. Experience teaches them to us. This article highlights several important concepts and tools — the fundamentals of working from home — but there’s a lot of empty space in between. Fill it! Color in the nuances that make your remote reality better. In the process, be thoughtful and stay diligent. You’ll be an old pro in no time. The post How to Conquer Working from Home: A Beginner’s Guide appeared first on Work from Home Happiness.